The New York Jets are now halfway through Sam Darnold’s rookie season. With their record at 3-5, the Jets can be somewhat pleased with themselves, despite coming off of a tough loss to the Chicago Bears. In their wins against the Lions, Broncos, and Colts, the offense used their whole playbook and flashed serious potential. In their five losses however, the offense has struggled on third down and in the red zone, and we are reminded that Sam Darnold is still a rookie. So Why did the Jets Lose to the Bears? The Bears have been playing well this year, with Mitchell Trubisky making strides as the leader of their franchise and the defense coming up in a big way. However, the Bears were coming off of a last-second loss to the Patriots, and were missing strip-sack king Khalil Mack. Still, the Bears have a strong position group at Linebacker, and talent across the defensive side of the ball. It was the Bears defense that ultimately won the day, holding the Jets to a meager 207 total yards on offense. The Jets scored a single touchdown in the contest early in the fourth quarter, converting their only Red Zone opportunity on a pass to Tight End Chris Herndon. Herndon is developing into a promising target, now scoring a touchdown in three straight contests. The Bears defense did exactly what you need to do to stop a team with a rookie quarterback. Chicago took away the Jets rushing attack in convincing fashion. Isaiah Crowell was held to just 10 rushing attempts totaling 20 yards. 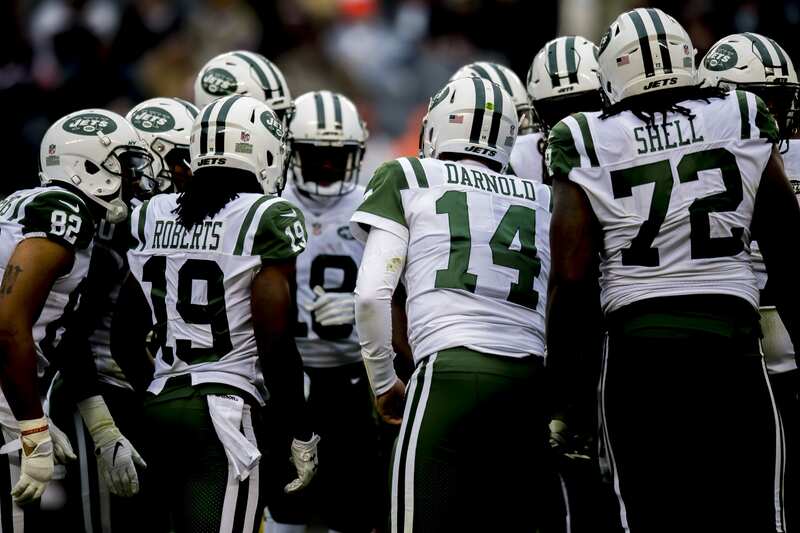 The Jets coaching staff should have structured the game plan to get Crowell more involved. The second leading rusher was Darnold with 9 yards on three carries. Rookie Trenton Cannon, replacing the injured Bilal Powell, was only able to find 8 yards through five carries. Although the Bears have a stout defensive unit, as Rex Ryan would say, you have to take pressure off of a young quarterback by running the ball. With no rushing attack to speak of, ideally Sam Darnold would be equipped with all of his weapons. Unfortunately, the Jets wide receiver corps has been depleted by injuries. Robby Anderson, the Jets only deep threat, was inactive. Quincy Enunwa, Darnold’s favorite target and best third-down option, was also inactive. Even Jermaine Kearse, the only veteran receiver available, seemed to take some shots during the game and get shaken up. Darnold threw to Kearse 8 times throughout the game, but Kearse was only able to manage 3 catches for 30 yards. Former practice squad player and USC Trojan Deontay Burnett had a good day, reeling in all four of his targets. Burnett figures to remain a part of the offense as the Jets continue to try and get healthy. Third down continues to be an area where the Jets desperately need to improve. The Jets were 3 of 14 on third downs on Sunday. To highlight the Jets offensive woes, they had 5 drives of 6 yards or less, and 8 drives of 20 yards or less. Forget trying to score, it’s tough to even play the field-position game with those kinds of numbers. Despite all of this, the Jets kept it to a one-possession game midway through the 4th quarter, which is a testament to the Jets defense. Despite a relatively meager performance on Sunday, there are still reasons for Jets fans to hang on to hope. No, not hope for the playoffs this year. Hope for the franchise. Sam Darnold, although looking like a rookie at times, is continuing to progress and look like a pro. He went without an interception on Sunday, which is always a good sign. He can clearly throw short routes and hit check-downs, making him an excellent fit for a West-Coast scheme. As Tony Romo pointed out on the broadcast, there are a myriad of things that Sam Darnold simply does not know yet, nor should he. Things like assigning pass protections will improve with experience. Romo also pointed out that the roster still has a lot of room to grow, so over the next few years the Jets can develop into a thriving franchise.